Join over 10,000 Minneapolis residents who are enjoying the benefits of saving money, energy, and are more comfortable in their homes thanks to the Home Energy Squad. Minneapolis has a goal of 75% of homes having an energy analysis done by 2025. Having a Home Energy Squad visit is a great way to do your part to help Minneapolis meet those goals. To encourage Logan Park residents participate in the program, the Logan Park Neighborhood Association is contributing $40 to the visit cost, bringing the resident copay down to $60, instead of $100. Home Energy Squad has been available in Minneapolis since 2010. An ever evolving program, adapting to the needs of customers; this year is now offering energy bill analysis at the visits when the data is available, infrared images in reports, and LED light bulbs installed. The visit takes about 2.5 hours. During the visit the crew installs energy saving materials, performs diagnostic tests, and helps you develop a customized plan for saving energy, making your home more comfortable and reducing your utility bills. It’s also a great time to ask any questions you have about your home. Materials installed during the visit for no additional cost may include: a programmable thermostat, a water heater blanket, pipe wrap, door weather stripping, high efficiency water fixtures, and LED light bulbs. They will conduct a blower door test, an infrared camera inspection, a combustion safety test on your home’s heating system and water heater, and check insulation levels in your attic and walls. At the end of the visit you will receive a custom report with prioritized recommendations. If your home needs insulation or air sealing upgrades the crew will give you a quote for the work to be done and you’ll have to option to schedule the work with a contractor that day. Home Energy Squad is provided by CenterPoint Energy and Xcel Energy and delivered by the Center for Energy and Environment (CEE), a local nonprofit. 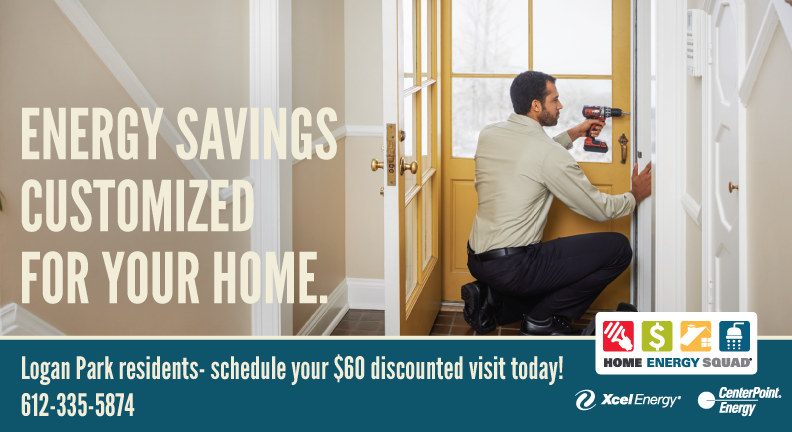 To schedule your Home Energy Squad visit today! Call 612-335-5874 or visit mncee.org/hes-mpls.